Acupuncture is one of the most successful techniques in Traditional Oriental Medicine with proven efficacy in drug/alcohol detox programs. The reason why most people fail in their efforts to quit smoking is difficulty coping with nicotine withdrawal. Withdrawal symptoms are unpleasant and painful, and may include cravings, fatigue, fever, headaches, insomnia, muscle pain, nausea, sore throat/dry mouth, sweating and tremors. You may also experience psychological and neurological symptoms of nicotine withdrawal such as anxiety, “brain fog,” depression, emotional volatility, irritability, and stress/tension. Acupuncture breaks the addictive cycle of nicotine abuse by treating both the physical and emotional symptoms of nicotine withdrawal. It helps your internal organs to function properly by cleansing toxins and promoting the free flow of Qi and blood. Acupuncture also reduces cravings, fatigue, fever, headache, insomnia, muscle pain, nausea, sore throat, dry mouth, sweating and tremors. This natural, holistic treatment also reduces stress and calms your mind. It relaxes your muscles and stimulates the secretion of endorphins in the brain. Acupuncture is also effective for treating anxiety, brain fog, depression, emotional volatility and irritation. Acupuncture is a safe, drug-free, and affordable alternative to Nicotine Replacement Therapy (NRT). NRT products such as gums, patches and prescription medications are not recommended because they often contain nicotine (or other chemicals which mimic the effects of nicotine). As a result, NRT often produces the same negative side effects and addictive as cigarettes. Many people turn to acupuncture after NRT and other more traditional forms of smoking cessation have failed. Health-conscious individuals also prefer acupuncture because it is a natural, holistic therapy. The number of treatments required depends on the length and severity of your nicotine addiction. A personal commitment to stop smoking is required for any treatment to be successful. Most patients are able to quit smoking completely after a course of 8-12 treatments (administered up to 2x or 3x per week). However, individual results vary and some individuals may need additional sessions or repeat the course of treatment in order to stop smoking permanently. Tightness in Chest: As fresh air fills your lungs, you may experience a tightness in the chest. Over the course of a few weeks, your lung function will improve and these symptoms will subside. Coughing: This is nature’s way of purging toxins from the body. Dry Mouth: Dry mouth is a common side of smoking cessation treatment. Drink plenty of water to avoid dry mouth and to aid the detoxification process. Dizziness: You may experience temporary lightheadness due to increased oxygen and improved blood flow after receiving acupuncture. Irritability: Acupuncture can help alleviate the stress and tension most people feel, due to nicotine withdrawal. Weight Gain: A small amount of weight gain is not uncommon. Acupuncture can help curb your appetite. You an also take herbal medicine to promote detox, improve digestion, and increase your metabolism. Other Temporary Changes: You can expect changes in bowel movements, urination patterns, appetite, sleep or emotional states as the body rebalances. Save with our Smoking Cessation Package! It includes a series of 8 private bi-weekly acupuncture treatments administered over 4 consecutive weeks, for just $480 (comes out to $60 per session). Are You Ready to Quit Smoking ? 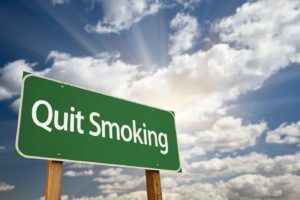 For more information about acupuncture for quit smoking in Connecticut and if it right for you, please call us at (860) 502-9462 to schedule a consultation. Our experienced acupuncturist, Dr. Han, will help you achieve your goal with compassion, care and dedication. Are you looking to receive an acupuncture treatment in West Hartford, Connecticut? We take pride in serving our community with compassion and care in West Hartford, Hartford, Avon, Simsbury, Windsor, Farmington, New Britain, Bloomfield, Cheshire, Middletown, Enfield and more across Connecticut.